Miltown Malbay Village is located in the West of Ireland in County Clare. Situated close to the Atlantic coast, this beautiful village has many sandy beaches closeby. Miltown Malbay is one of the centres of traditional Irish music in Ireland. Most nights of the year, live sessions take place in the local pubs where traditional Irish music, dance and song are part of the daily life in Miltown Malbay. Many visitors arrive for the sandy beaches and the beautiful scenery around Miltown Malbay. 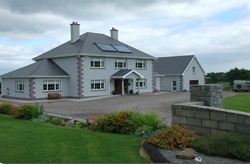 Aeroplane: Shannon Airport is the closest airport to Miltown Malbay Village - 54km. Click here for details on Irish Airports. Sorry there is currently no listings for Miltown Malbay.